I smelt the fragrance of these little Christmas gems in the shop the other day and knew it had to go on my wish list. The glazed apple range smells incredible and is my favourite out of all of their Christmas range, the Vanilla Brulee and Frosted Cranberry ranges weren't really my cup of tea. This product is so cute and I love the tin it comes in, which is why it is the perfect Christmas gift and is on my list. I recently tried two of Topshops lipsticks and really want to try one of their lip bullet products, so this is a great opportunity to try them out. I mean both for a tenner is a bargain, especially since individually they cost £8!! Oh how I love Christmas sets and deals, it is definitely the best time of the year. I have regretted not buying this cardigan ever since I tried it on in River Island and still really want it! It is such a warm cardigan and I love how it looks, definitely perfect for winter. Ever since I got my Pandora bracelet for my 18th birthday, it has become a sort of tradition that I get one from my mum every birthday and Christmas. So I normally select a couple from their booklet and give it to my mum to choose one for me. This Christmas I selected three and cannot wait to see what one she goes for. I love the 'My Sweet Pet Charm' as the paws on the heart are adorable and I have a dog so it would represent my border collie on my charm bracelet. The 'Fairy Pixie Charm' is cute and when I was younger I really loved fairies, so it's like a piece of my childhood. Last but not lest on my Pandora wish list is the 'Floral Heart Padlock Openwork Charm' is just so pretty and would go perfectly on my bracelet. 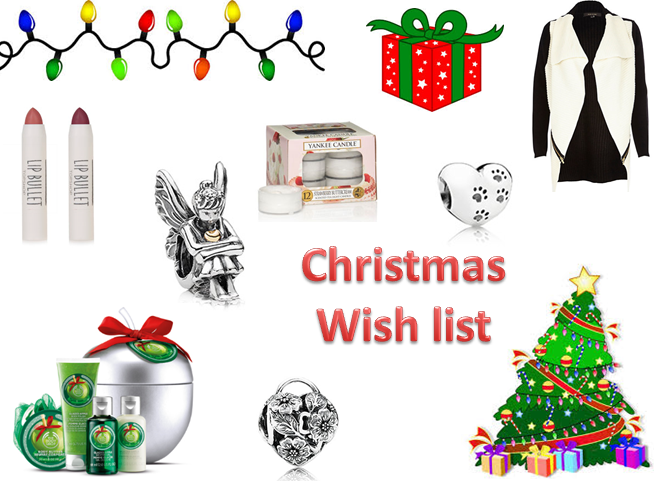 What is on your Christmas wish lists?